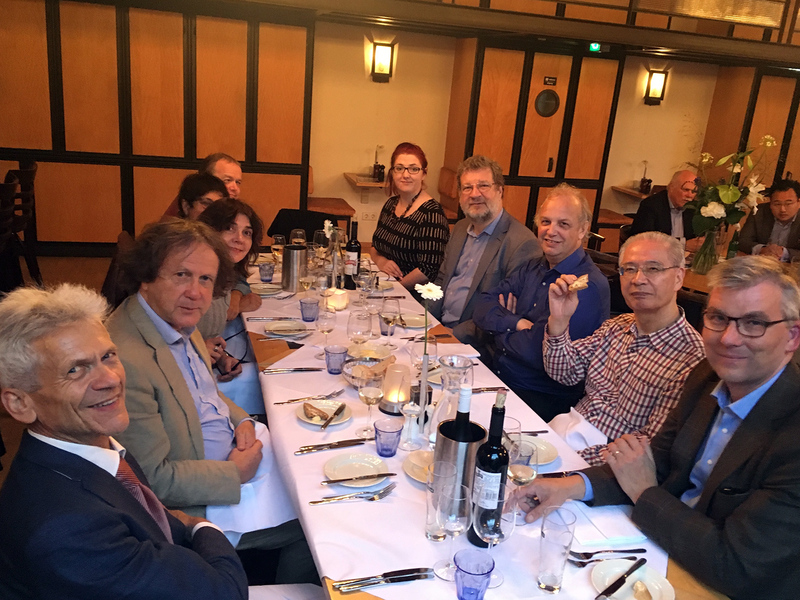 A group consisting of twelve philosophers —from Japan, India, North America and Europe: (from left to right in the picture) Douglas Berger, Makio Takemura, Gereon Kopf, Chiara Robbiano, Paul Ziche, Shalini Sinha, Stephen Harris, Joanna Jurewicz, Rein Raud, Sarah Flavel, Richard Seaford, Johannes van Ophuijsen— spent two days together in Utrecht (the Netherlands) carrying out an uncommon philosophical dialogue, both at University College Utrecht —in front of an audience of students, professors, artists and other interested people— and during meals and walks in the city of Utrecht. This unique event has been fully sponsored by the Toshiba International Foundation. These experts on Japanese, Chinese, Indian, Ancient Greek and Western philosophies discussed, among other things, the status of concepts and their relation to reality; compared views on what is a human being; asked each other questions about the nature and purpose of philosophy; and constantly monitored the discussion by reflecting on the requirements for a successful dialogue. Our awareness of the range of possible answers to certain fundamental questions has definitely grown in the past two days, together with our capacity to articulate our views on the subject. Not only have we learnt so much from each other’s different fields of expertise, but we also trained ourselves in dialogue across different worldviews, by correcting the urge to ‘lecture’ to each other about what we happen to be experts on. Not only ideas for future collaboration have arisen, but also the willingness to introduce this kind of dialogue in our teaching. Those of us who were less acquainted with Japanese philosophy have been triggered not only to look deeper into it, but also to introduce some fundamental philosophical texts in our teachings. The discussion started by reflecting on one of the philosopher’sfundamental task: that of clarifying concepts and defining words, which led us to see philosophers as those who can facilitate dialogues, having read and carried out philosophical dialogues. By means of dialogues, shared meaning might be found, which does not necessarily involve agreement, but opportunity, for all involved, to modify one’s assumptions. We discussed conceptions of language and we seemed to converge on some version of nominalism, which allows for language to be communicative, without taking it to reflect an alleged unchanging logical structure of reality. Even if reality does not have such a structure, it is possible —rather than talking at cross-purposes and imposing monologues to each other— to encounter the other in a real dialogue, in which questions are asked, answers are listened to. We explored the difference, coming from Japanese philosophy (Dōgen), between dead words, which occur in monologues, and living words, which can fully capture the present moment —this seemed to form an alternative both to nominalism and naïve realism. Many questions were raised: do we need always-new concepts or should we try to upgrade old ones? Should we use our creativity to allow for the number of concepts needed to make sense of reality to increase, or should we use our Ockham’s razor to cut down the concepts that turn out to be confused? Should we build a conceptual framework made of concepts that are shared by holders of complete different worldviews? Experts on the Japanese philosopher Nishida suggested that the philosophical conceptual framework should consist of shape-shifting concepts, in need of being constantly attuned to changing times. What seems difficult to disagree with is that philosophers unpack concepts, but whether it is good practice to eliminate something (what is irrational, what is not coherent, what is only emotional etc.) after the unpacking is done or not, it is still a matter of debate. What we seem to agree on is that clarity and awareness result from this unpacking practice. We discussed whether philosophy’s language needed to involve generalisations and ‘abstract’ language and what that involved. We realized that if that involved cutting out metaphors, nothing at all could ever be expressed. We discussed whether demarcating what philosophy —or philosophical language— is against what it is not might have the unfortunate effect to exclude certain traditions or certain discourses and ways of making sense of reality and our place in it. Perhaps philosophy should be rather defined by taking the purpose of its enterprise into account. Is philosophy an interpretative, hermeneutical enterprise or a foundational one? Should it be the practice geared towards liberating us from certain sources of suffering, such as unexamined acceptance of the beliefs of our age —be that scientific, political or religious dogmatism? Or should it liberate us from lack of meaning and egotism? What is the difference from religion, besides the willingness to discuss any assumption, rather than accepting them because they come from a scripture? It has been suggested that the framework provided by philosophy should not directly capture personal ineffable experiences or dictate any meaning to any of us in particular, but should facilitate such search for clarity, awareness and meaning that each might carry out on their own. We discussed what makes us human. Different traditions single out as our human trademark the capacity to realize ‘what is common’, gathering together ‘the many into the one’ —but an interesting difference has emerged between these traditions in which what is common is the possibility of achieving a certain liberating insight into the nature of reality and its articulation; whereas others focus rather on our shared suffering, which leads to compassion as our most important characteristic. None of the two conceptions seemed to necessarily imply the existence of a shared human essence and, most interestingly, none of them assumed the individuals to be the fundamental building blocks of reality. While Nishida suggests that the individual emerges from its encounter with the other, Plato states that what we take to be individuals are braiding of forms, and Śāntideva might have regarded compassion as what is fundamental both ontologically and soteriologically. Different traditions seem to encourage grounding our life in what might be described as ‘common’, ‘one’, ‘absolute’, and which can only be reached by transcending oneself into the other, rather than living according to our private, idiosyncratic view and preferences. Some philosophers stress action as what can take us out of ourselves, whereas other stress insight; some point at the constructed nature of the individual, such as the Indian concept of I-maker’, which suggests the possibility of ‘unmaking’ it. “As a specialist in Indian philosophy, I have never had the chance to work seriously with intellectual thought from Japanese philosophical traditions. I was surprised to find how strong convergences were present in the thought of Nishitani, from the Kyoto school, and the Indian philosopher Śāntideva, both of whom link reflection on human suffering and the future with metaphysical understandings of the emptiness of self and relatedness to others. 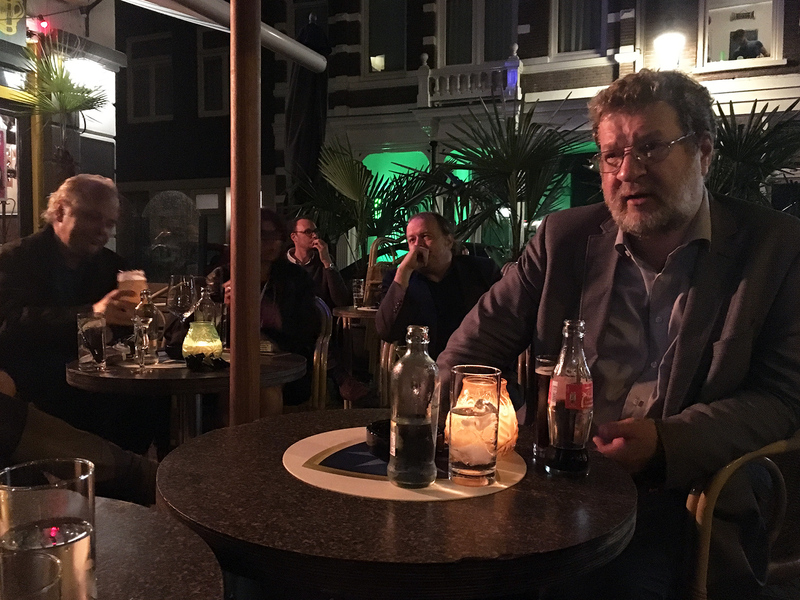 Another great benefit of the conference was having specialists from so many traditions in conversation with each other; I appreciated Chiara's invitation of a scholar of ancient Greek thought, as well as two scholars from the Netherlands who work in the history of Western philosophy. All these sources of knowledge created an amazing dialogue on the central questions of the conference.” Dr. Stephen Harris, Leiden University, the Netherlands, Indian Buddhist philosophy and contemporary ethics. “It was great pleasure for me to be able to join such very important seminar. Thank you very much for inviting me to this seminar. I could learn a lot of things.” Prof. dr. Makio Takemura, Professor in Buddhist studies and philosophy of religion, President of Toyo University, Tokyo, Japan. “Given the nature of philosophy, the very format of a gathering such as this which is not exclusively devoted to the study of Japanese thought, proves well-suited to promoting Japanese thought as a force in world philosophy, not to mention the possibility of Japanese philosophy being further enriched by injections from other traditions.” Prof. dr. Johannes van Ophuijsen, University of Utrecht, the Netherlands, Greek, Islamic and Analytic philosophy. “These dialogues were really the meetings of philosophies”. In principle, I would prefer to live in a world where there would be just one “field” of philosophy with different kinds of stuff in it, but currently the differences are there and we are better off with a plural. 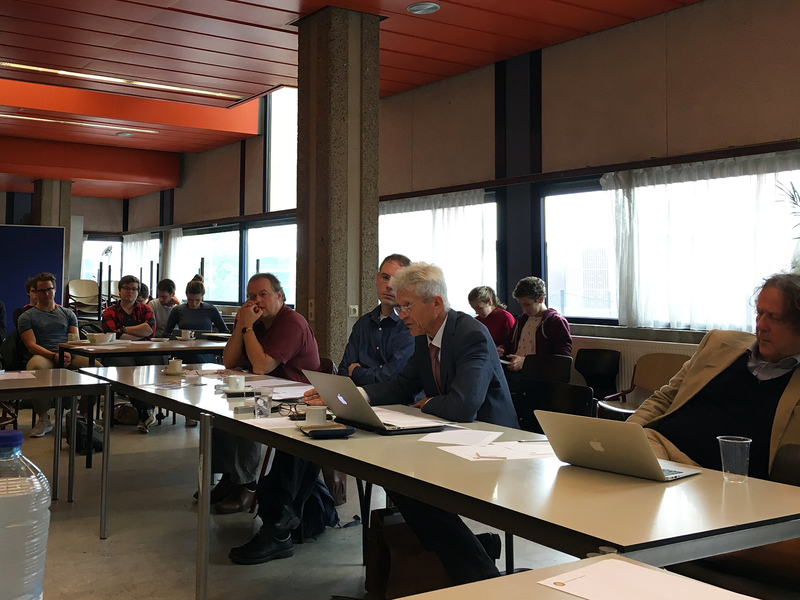 I appreciate it very much that thanks to such people as Chiara Robbiano, Paul Ziche and Johannes van Ophuijsen, Japanese philosophy is making contact with philosophy (and not merely area studies) departments in such prestigious universities as Utrecht.” Prof. dr. Rein Raud, Tallinn University, Estonia, Japanese and Asian philosophy. “Dear Chiara, Many thanks for a superlative conference with the best possible format. I have nothing to add to your account. The conference had numerous benefits. But I would like you to know that from my own (unusual) perspective on philosophy, it was especially useful to be forced out of my assumption- bubble. Of course, it was and is easy read about Indian and Japanese philosophy. But listening and dialogue are quite different: one becomes part of a drama that remains in the memory, expanding consciousness permanently. That is why reading (even if one does decide to read outside one's comfort zone) is no substitute for a conference of the kind that you created. All the best, Richard” Prof. dr. Richard Seaford, professor emeritus of classics and ancient history, University of Exeter, U.K.
“The workshop was excellently organized and provided a rare, fruitful opportunity for scholarly exchange. As a researcher in Japanese philosophy, there are very few opportunities to showcase the Japanese contribution to global discourse in a broader philosophical context. I hope that the events that have taken place so far can be fostered longer- term in order to further promote dialogue between world traditions in this manner. I found the unique format of the workshop, with its focus on dialogue, to be particularly valuable. The feedback from participants and students was resoundingly positive. It was an honor to participate in this discussion and I look forward to taking part in more events like this in the future.” Dr. Sarah Flavel, Senior Lecturer in Religions, Philosophies and Ethics, Bath Spa University, U.K.
“The Toshiba conference was undoubtedly one of the most insightful and creative encounters I have had with fellow philosophers in recent years. 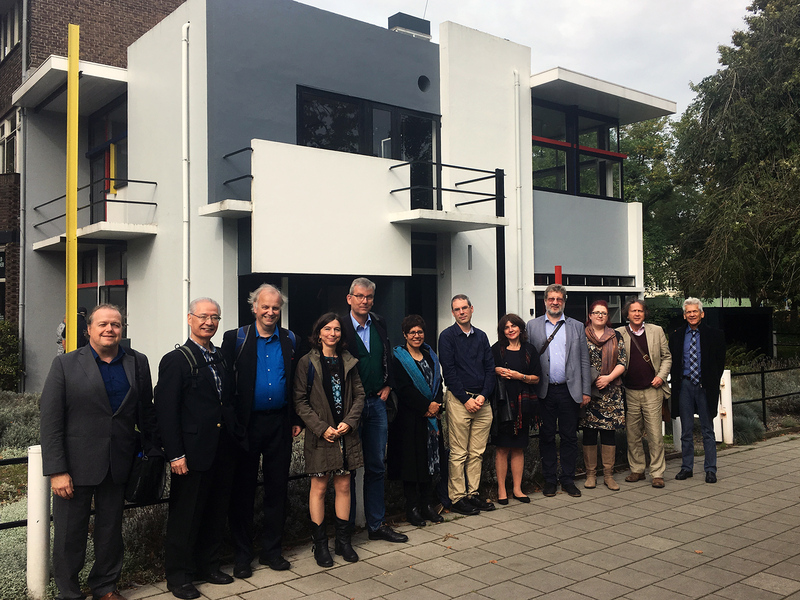 The opportunity to discuss core philosophical concepts such as reason and rationality with philosophers deeply interested in cross-cultural approaches proved invaluable. Philosophical conversations with specialists in Japanese, Chinese, Analytical, and Indian philosophy were enriching not only in deepening my understanding of the approaches and commitments of other philosophical traditions but for developing my own research interests. The value of future encounters between philosophers who are deeply committed to cross-cultural philosophy, such as that provided by the Toshiba conference, cannot be overstated in my view.” Dr. Shalini Sinha, University of Reading, U.K. Classical and Contemporary Indian philosophy. “From my point of view, there were (among other things, of course) very interesting similarities between the thought of Nishida and the Brahmanic thought (the negation of the Absolute). That is not surprising because the Buddhism begins in Indian thinking, even earlier than the Pāli Canon.” Prof. dr. Joanna Jurewicz, Chair of South Asian Studies, University of Warsaw, Poland. “The Philosophy workshop funded by the Toshiba Foundation was superbly organized and provided an excellent environment for cutting edge discussions on 1) the nature of philosophy, 2) the role of Japanese philosophy, and 3) ways to bridge the gaps between philosophical tradition. 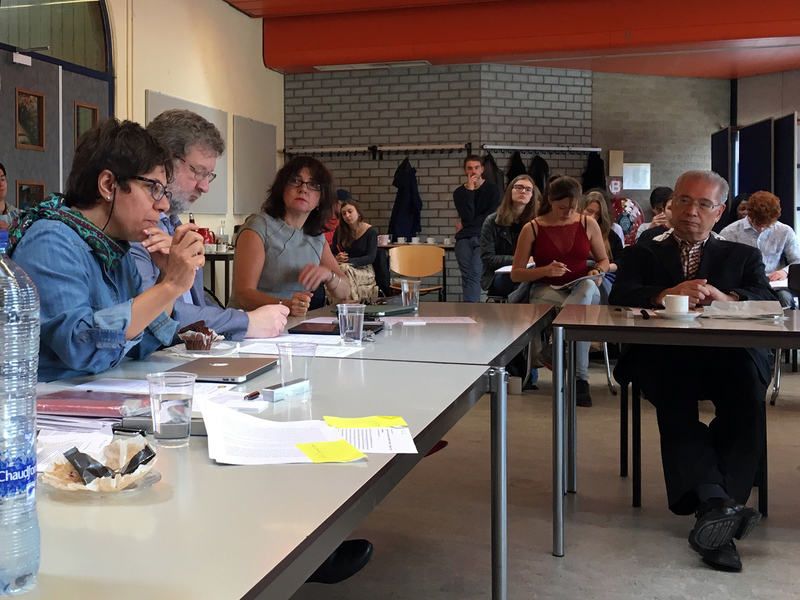 Bringing together philosophers form the Japanese, Indian, and Greek philosophical traditions, this workshop explored the ways and methods to engage in constructive dialogue across cultural boundaries and to guide the philosophical discourse into a new era. Philosophers from the Japanese traditions have not only contributed to the global philosophical discourse for the last 120 years, some of them have also provided a blueprint of how this dialogue and cooperation can be successful. Global problems require global discourses and the participation of Japanese philosophers. 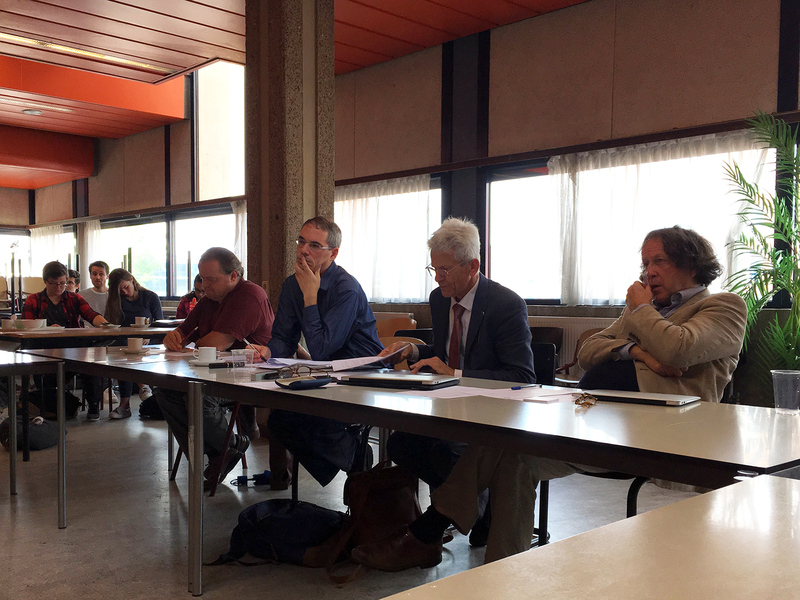 This workshop (together with the workshop in 2016) constitutes a milestone in this process.” Prof. dr. Gereon Kopf, professor of Religion and Japanese, Buddhist, Comparative philosophy, Luther College, U.S.A.
"Professor Robbiano has organised a very interesting meeting where 12 leading experts gathered to discuss the obstacles that turn up in almost every project of cross-cultural philosophy. To be sure, those obstacles will not vanish overnight, but they will have to be tackled time and again. The discussion probed the depths of our cultural awareness, which made the meeting very rewarding, also for the audience. Thinking Japanese philosophy means being aware of its identity and cross-cultural dimensions, which means that the cultural identity of the thinker is at stake. Apart from Schopenhauer very few Western philosophers have been aware of the philosophical treasures that are hidden in non-Western thought and the reason might be the one-sided take on questions that were discussed during this conference, like what is rationality, what are ideas, what makes us tick and what is philosophy? The answers to these questions can never be definitive but will have to be reconsidered in every cross-cultural philosophical project. They will continue to bring a deeper understanding of ourselves and our fellow human beings. I look forward to see the papers that will appear as a result of this gathering." Erik Hoogcarspel, independent philosopher. 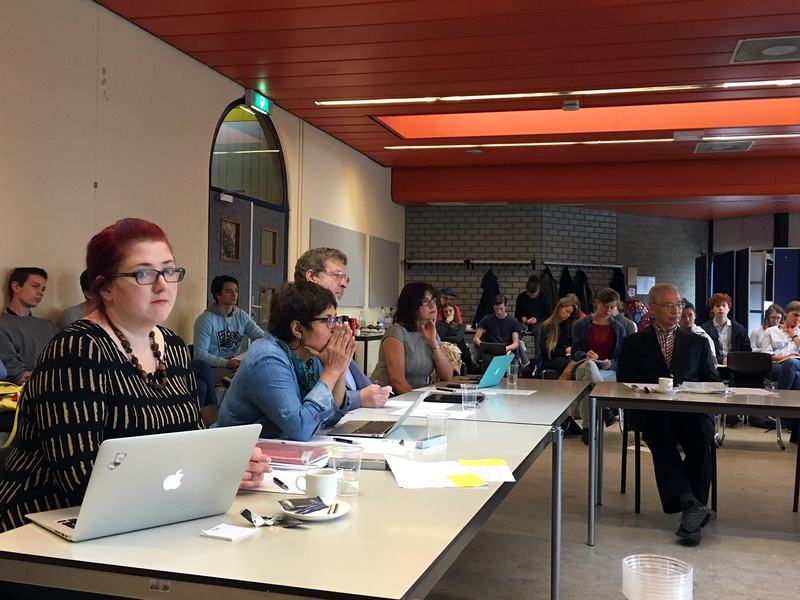 "I found the Uncommon Dialogue chaired and hosted by Dr. Chiara Robbiano at Utrecht University to be very insightful and intellectually stimulating. What a wonderful initiative to bring expert philosophers from diverse backgrounds to discuss various thought-provoking subjects!" Dr. Mark T. Kawakami, Esq., Assistant Professor at Maastricht University Faculty of Law. What made this dialogue possible —besides the generous grant by the Toshiba International Foundation and the time and passion invested in it by all involved? Was it the shared assumptions about the function and importance of philosophy? Or was it the difference in assumptions that allowed us to escape our assumptions-bubble and encounter the other? Was it the philosophers’ openness to ask questions and listen to the other’s answers? Was it our willingness to see the one in the many, or our love and capacity to leave the many as many, provided we have some sense of what the many might be? Can we make sense of them because we share a conceptual framework or perhaps because our philosophical conceptual frameworks have family resemblances to each other? Was it the awareness of our assumptions, and of where they come from —which we gained by asking questions to each other— that allowed us to compare assumptions and possibly reconsider them? Was it our ability to represent the position we assumed to be the other’s and check it against their own representation? Was it our capacity to enlarge our frame of reference if the one we were using caused the discussion to get stuck? Was it because philosophy, to all of us, is not just a 9 to 5 job but a way of engaging in what is relevant to us— not only the ‘science of clarity’ (literal translation of the Japanese word for philosophy ‘tetsugaku’) but love of wisdom? Was it because we were able to look at different views without asking of them whether they are right or wrong but what contexts and values do they express and whether they can shed light on any question or predicament we deem as important to us? Was it because we want to go beyond history of philosophy, analytic philosophy and comparative philosophy —and try to do philosophy, which is not only about what mattered to some people dead long time ago, but also about what matters to us —such as birth, death, suffering, liberation— and which can only be looked at in dialogue.